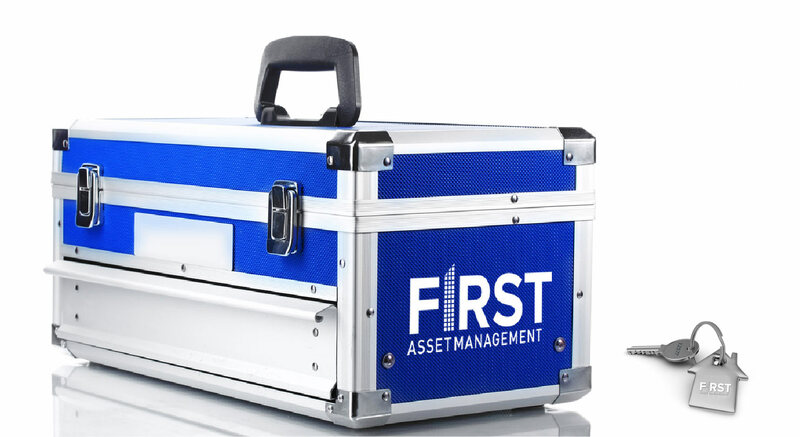 First Asset Management will help you realise the highest possible returns from your retail investment, and we'll make property ownership hassle free - that's our promise to you. We've been delivering specialized retail asset management services to small, medium and large retail investors alike since we opened our doors for business back in 2009; we have established a growing loyal client base with over 100,000 sqm of quality retail/commercial space now under management by First Asset Management and a reputation for delivering retail asset management services to a standard that our competitors simply can't match. We succesfully manage a wide range of retail assets accross South East Queensland including small, medium and large retail centres with a variety of different tenancy mixes. 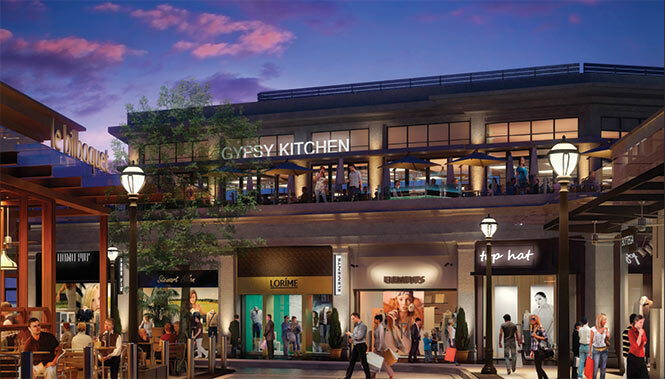 Wether you are a long-time or first-time retail property investor, you won't do better than First Asset Management when it comes to your retail asset management. Contact the Industry Leaders in Retail Asset Management - First Asset Management to discuss your unique retail asset management needs, or request a confidential FREE Property Health Check online. 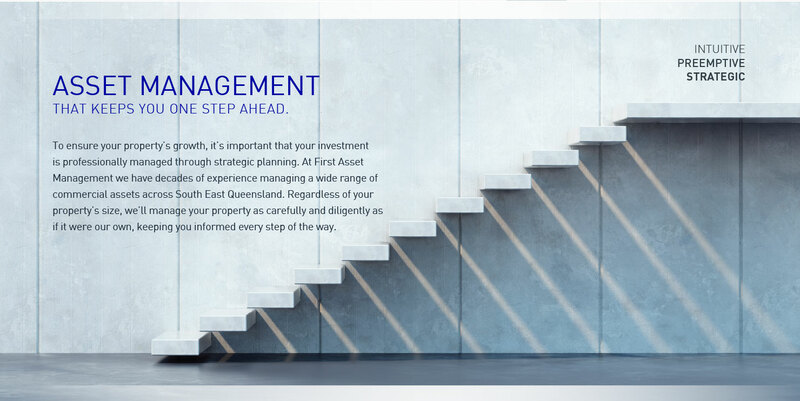 If you are looking to maximise the returns you receive from your commercial property investment, look no further than First Asset Management. We will manage your investment as if it is our own. Regardless the type and size of your commercial property, partner with our commercial asset management team and you will be in good hands. 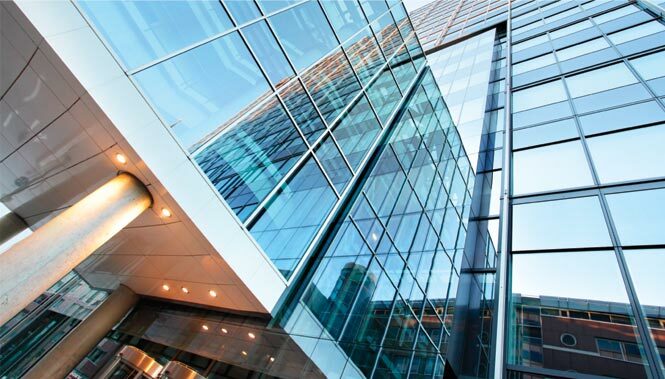 The future value of your commercial property is dependent in part upon the quality of its management. 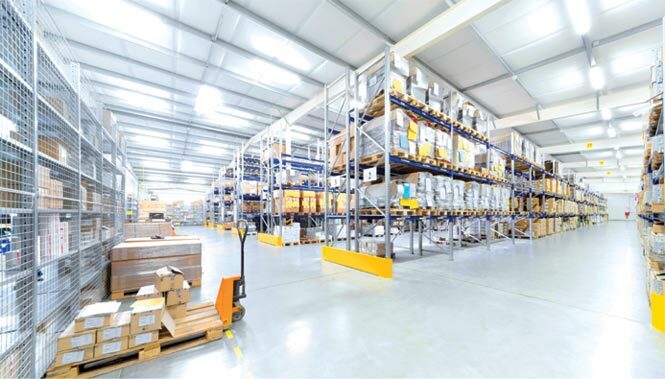 Contact the Industry Leaders in Retail Asset Management - First Asset Management to discuss your unique retail asset management needs, or request a confidential FREE Commercial Property Health Check online. 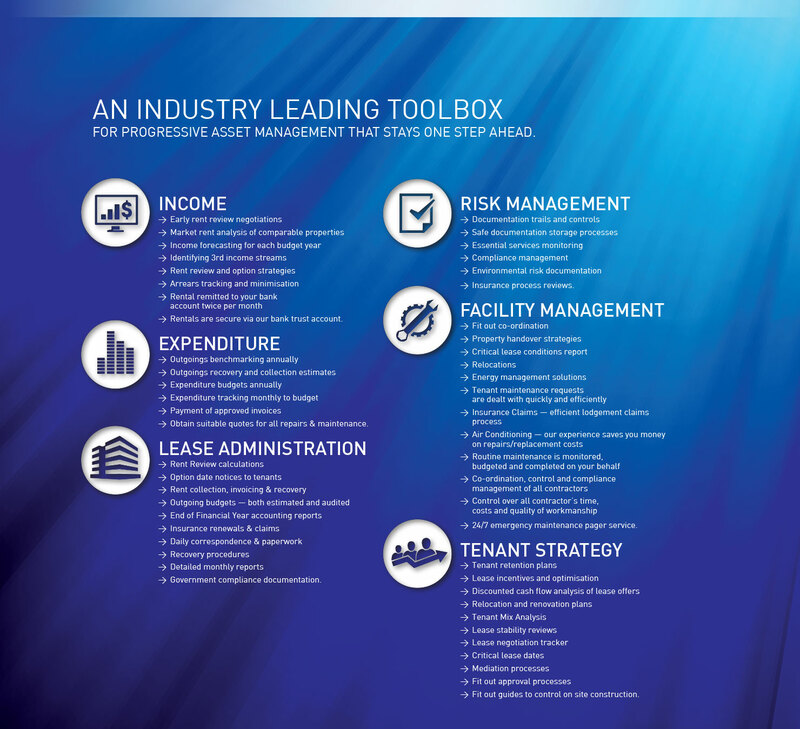 HERE ARE JUST FEW OF THE SERVICES WE PROVIDE WITHIN OUR MANAGEMENT OFFERING, DESIGNED TO MAXIMIZE THE RETURNS FROM YOUR RETAIL, COMMERCIAL OR INDUSTRIAL PROPERTY INVESTMENT. Naturally, we'll ensure your property maintains its marketing appeal at all times and will keep a keen eye on all tenant's plans, advising you of any intensions to vacate, long before moving day. 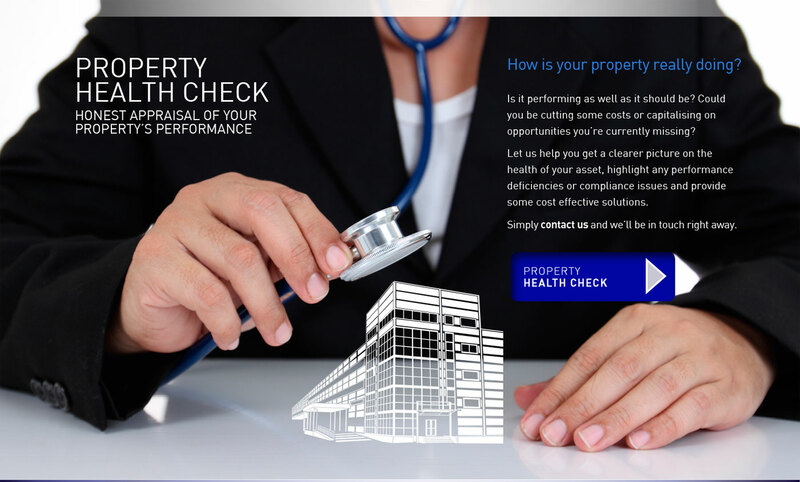 We conduct fortnightly inspections to stay abreast of everything that's happening in your property and report back to you regularly. We have a instinctive and keen eye for detail - from your rights and responsibilities as a property owner, to ensuring the terms and conditions of your lease are met. Everything we do is designed to make life easier for you, including our reporting. We can provide up-to-the-minute reports on your property at any time, via our adept property management software. These reports are fully compliant, easy to read and suitable for use by you, your bank, accountant or solicitor. 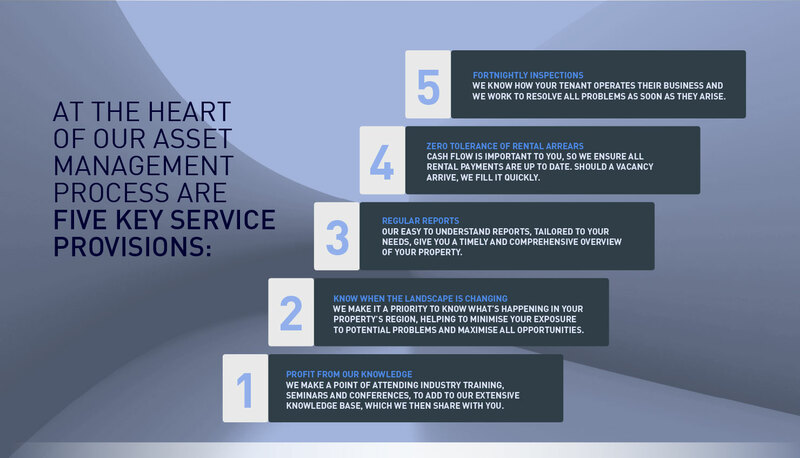 Our 'hands on' approach is focused on ensuring the long-term growth and sustainability of your tenants and your property. We offer a 24/7 help desk service for you and your tenants, carry out through fortnightly inspections, arrange for maintenance or repair work on your behalf and so much more. Managing your money and cash flow is a top priority. We are transparent and precise in our dealings and attend to more money matters than you might expect, including; rent collections, outgoings recoveries, mid and end of month remittance of rent to your account, budgeting, forecasting and variance reports, as well as ensuring your building is adequately insured and claims are made on your behalf.